Canoga Park Truck Accident Injury Lawyer - Over 40 Years of Experience You Can Trust! Have You or Anyone You Know Suffered an Injury in a Truck Accident or Car Accident in Canoga Park? Our Canoga Park truck accident injury attorneys and law office provide compassionate and aggressive legal representation for the victims of truck accidents and their families, which can include truck accidents from light minivans to heavy ballast tractors, and offer support for wrongful death claims in the community of Canoga Park in the city of Los Angeles in Los Angeles County, California. Canoga Park is surrounded by West Hills to the west, Winnetka to the east, Woodland Hills to the south and Chatsworth to the north. The Canoga Park area was part of the Mission San Fernando that was owned by Spain from 1797 to 1846 and later became controlled by Mexico in the Mexican War of Independence. When Americans took control of Canoga Park, it became an area of wheat farms and today it has developed into a developed city with currently one of the largest shopping malls on the west coast, which is known as the Westfield Topanga Mall. Canoga Park has had a few stars that resided in the area such as Bryan Cranston, who starred in the show Breaking Bad, and Eugene Selznick. Please visit our Truck Injury Accident Web Site, where you can find more helpful information about truck accident injury claims. When coming up to a bridge or tunnel, it is important to use caution by reducing your speed and checking to see if other vehicles are driving carelessly, to avoid a dangerous accident. Some bridges do not have a center divider, making it more likely for a oncoming vehicle to accidentally enter your lane, which means that you must watch out for vehicles on both sides of the road. A collision on a bridge, especially with a semi-truck or big rig, can very likely force your vehicle onto the edge of the bridge and depending on the height of the bridge, create a situation where you can end up in a fatal crash. For example, a truck may collide with a smaller vehicle and the impact can force that vehicle over the side rail and have it drop from a high elevation onto the ground beneath. In addition, tunnels are dangerous by tending to have more narrow lanes and a crash in a tunnel can cause your vehicle to hit the side wall of the tunnel that can also lead to a severe injury. Larger trucks should be completely focused when going through a tunnel, because they might take up more than their own lane and if the road curves, then they need to anticipate the sharpness of the turn in the tunnel and adjust their speed accordingly. Taking these precautionary measures will ensure a safe passage through tunnels and bridges that can significantly reduce the amount of fatal truck and car crashes. 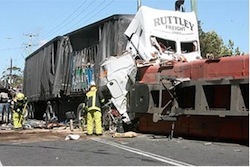 Truck accident victims face many types of injuries such as a wrist fracture. Wrist fractures are the least common type of fracture, but the majority of young adults suffer wrist fractures through a motor vehicle accident or falling from a significant height. Some of the wrist fractures only require a cast to heal, while others need surgery. Arthritis may also be a problem for those having a wrist fracture injury in their past, with some people experiencing a weakness in the radius bone earlier in their lifetime. If you or anyone you know suffered a wrist fracture in any truck accident or other personal injury accident in Canoga Park, Los Angeles or anywhere in California, please contact us now, including for referrals to doctors who may provide treatment without a request for payment until the claim is resolved. For more information about our senior attorneys, please visit our Attorneys’ Profile Pages. The Law Offices of Gary K. Walch, A Law Corp., provides you with the strong advocacy that you need when you or a loved one has gone through a horrible truck accident or other injury accident in Canoga Park or anywhere in California, and at the same time offers compassion and understanding to make this process easier for you and your family. It is our goal to aggressively pursue your rights and best represent your interests. Our lawyers handle accidents involving truck, car, train, bus, motorcycle, bicycle, uninsured motorist (UM), pedestrian, hit and run and much more.